We missed your mom and dad (and you too) at the Smith family reunion in Aug. He was thought of fondly. I’m always taking photos of the moon, but that night, I was struck by the color. I looked online to see if there was something special about the moon’s phase this time of year, and was stunned to see the moon’s age on that day. It just reinforces my belief that he is here, holding her hand as she takes what must feel like giant steps in her new life without his physical presence. It’s a tough one Kelly, I’ll be honest…but these little things help. And thank you, yes, I have a pretty wonderful family. Well she’s so lucky to have you there to help. There are many transitions in life, and I agree with you that this one is one of the hardest. You have a beautiful way of remembering him with the beauty of the moon. Beautifully done, SB. 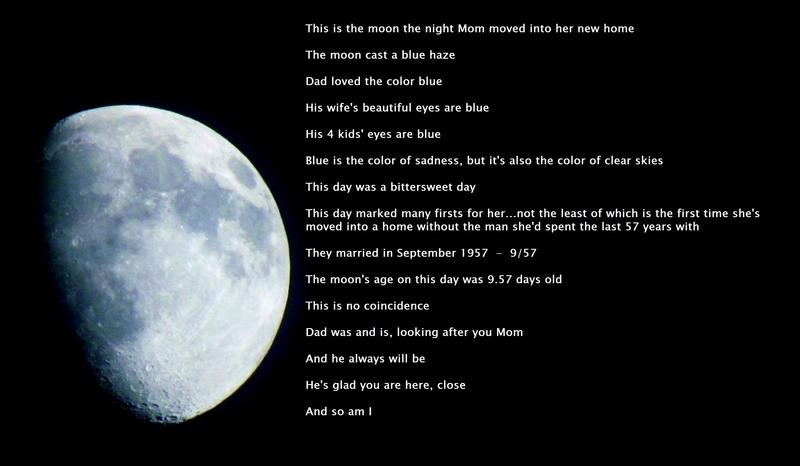 Thanks for sharing this, and I hope your Mom knows that he is watching over her. That really is an amazing coincidence… but then I don’t know that such things can be coincidences. I agree NB…I don’t think in terms of coincidence. I think it’s much deeper than that, and I hope she sees it the way I do. It’s not been an easy time, but I’m glad we are together…I think it helps. SB, you never fail to amaze me with your heart. It’s on my sleeve NB…always has been and always will be. Oh Rhonda this is too beautiful. This is beautiful and I don’t believe in coincidences either. Your Dad is with you and with Your Mom. I’m glad you have a wonderful family, it is a sense of strength and warmth in the winds of change. Take care of yourself too.